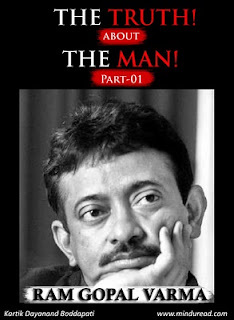 Ram Gopal Varma, the name evokes a lot of reactions and emotions, mostly bordering on the extremes. But for me, he has been one of the most defining influences in life. I often think how insensitive a nation we are not to give due credit to a man as influential as him. His contribution to modern Indian cinema is unparalleled and something no one seems to fathom yet. You want proof of his achievements. Then read on. 21 years ago, this man who no one knew about, landed into the movie industry with a punch so great that it would put even Mike Tyson to shame. Very few people in India have been fortunate to experience the phenomenon that he created. Alas, it was a regional movie and only people who spoke a certain language could see what hit them. The movie was later remade in Hindi, but I would rather prefer to talk about the original than the carbon copy. So, the year was 1989 and it was a time when the movie hero was a superman who could jump buildings, somersault in the air, fight with a tiger, finish off an entire army with his kung fu antics and still find time to sing songs and dance around trees with buxom beauties. Yes, this was the hero of the 80’s. In the middle of this came a little man straight out of an engineering college to make his first movie based on campus politics and the mafia, shot in a very gritty and realistic style. The movie was called SHIVA, a sensational trendsetter of a movie that changed the face of Indian cinema forever. SHIVA, what does the name remind you the moment you hear it? Most people would say, it’s the name of a Hindu god. But, I challenge you, ask any Telugu speaking guy and see what he or she would say. The first thing that comes to mind would be this movie. It’s been 3 generations since this movie was made (they say every 7 years a generation changes) yet the name still evokes the same response. Such is the impact he made with his first movie. Akin to something a SHOLAY did to the nation in the 70’s. It’s most poignant and unforgettable character being GABBAR. The character that has been the source for numerous spoofs and spin offs to keep his memory alive till date. Shiva does not have this benefit, yet it continues to haunt the collective consciousness of millions of Telugu speaking people everywhere. I have no doubt in saying that by creating this character SHIVA he defeated GOD and GABBAR at once in terms of sheer recall value and impact. If I start writing about this movie, I guess one blog post would not be enough, I would rather write a book about this. Therefore, I will not elaborate much on this but move on to what he did next. My intention of writing this post is not to chronicle or document the movies that Ramu has made but to highlight the highlights of his achievements. The biggest challenge for any film maker is to create enduring characters that stand the test of time. This could sometimes turn out to be a bane rather than a boon. Ask Mr.Ramesh Sippy what happened to him after he made Sholay, or to Amjad Khan who played Gabbar. They could never in their lifetime better that movie or performance. Ramu is someone who has played this game well enough. He has consistently created memorable characters and yet managed to reinvent himself with every subsequent movie that he has made. The actors who played his characters have fared well, but except few, most couldn’t come out of the mould created by Ramu. Remember Bhiku Mhatre (Manoj Bajpai), Mili (Urmila Matondkar), Munnaa (Aamir Khan), Chandu (Vivek Oberoi), Subhash Nagre aka Sarkar (Big B) or even smaller characters like Kallu Mama and Pakya. It is not just the main protagonist, but every single supporting character that gets a life in his movies. Hence, in a movie like Sarkar, which has a towering performance from the BIG B, he gives enough space for other actors like Junior B, Kay Kay, Rukhsar, Tanisha, Katrina Kaif, Supriya Pathak,etc to shine and have their presence marked. It’s all about memorable characters and he has been a master at it. This reminds me of a story I must share from my school days. It must be sometime in 1990 that the shooting for the Hindi version of Shiva was taking place in a school close to my house. I was so super excited that I tagged along my little brother and landed up at the shooting spot to see my favourite director. I hung around the entire day, but couldn’t get a glimpse of Ramu. I had my autograph book with me and I thought I could get his autograph. Instead I ended up meeting a lot of the junior artists who played key characters in the original version and were recast in the remake. I was overjoyed to get their autographs too, much to their and later my family members amusement. They wondered what was wrong with me. For me, they were like characters from a novel, characters to be preserved for posterity. Seeing them in flesh and blood made my day. To see Ramu in person, I had to wait a few more years, and then, to get his autograph, a few more years after that. I often used to wonder how he had so many ideas to make films. Finally, one day I witnessed something that made me see this man in a new light. It was sometime in 1998 at a Chennai movie hall off Mount Road. I don’t recall the name of the movie hall right away but it was one of those really old theaters that was on the verge of closure. That evening it was playing an English movie called Turbulence . Very few heard of this movie and very few ventured out to watch this movie. I being the movie buff that I am, was all alone in the balcony when I saw two gentlemen enter the hall moments before the film was to start. I felt a strange sense of familiarity when I saw these people walk in. Holy Cow! it was Ram Gopal Varma. What do I do? Am too nervous to even react. I had to get his autograph, damn I wasn’t even carrying a pen. What do I do? I run out of the theater to one of the Tea Kadais (tea stall as they call them in Chennai) and manage to buy a pen. During the interval, I muster the courage to go upto him and introduce myself as a big fan of his. This man was so extremely shy that I couldn’t believe he was the same man who made my favourite movies. He gave me his autograph with a smile. I couldn’t sleep that day and for a few days after that. But the one thought that kept ringing in my head was, what the hell was this man doing at this theater in the first place? He must be a busy man, I believe he was still shooting Satya at that time. What I realized that day is a logic similar to what they say about being a good listener being more important than being a good talker. So here was Ramu doing all the listening, I mean, watching the movie and being a good student of cinema though I am sure he could have had a million other interesting things to do if he had so much time in his hand. In summation, to me he looked like a true disciple of cinema and the hunger to learn was evident in his eyes. They say, there is no original creation in this world, originality lies in how well you conceal your source. Well, most of Ramu's movies have been inspired by other great classics, be it movies or real life characters. He himself constantly acknowledges this in press as well as his blog. Talking of inspiration, unarguably the greatest movie India has ever produced, Sholay, is heavily inspired by the curry westerners of yore. Speaking of which I must mention about a movie made by the grand old master of cinema, Akira Kurosawa. Kurosawa made a movie called Seven Samurai , which was later reincarnated into many many different versions that one has lost count of now. Most popular adaptations or inspired movies being Magnificient Seven , Dirty Dozen , Guns of Navarone , Pixar's A Bug's Life and our very own Sholay, each a classic in its own right. So the point of being a great movie is not in its originality itself but in the impact it makes over the viewer. Hence a Sarkar is no less than a Godfather , nor is a Bhoot very different from an Exorcist. Though the premise being the same, it takes away nothing from the films impact on the audience. In part 02 of this post, I will talk specifically about three things. His Technique and mastery over the craft of film making, the Trends that he has set, many of which most are not aware of and finally the Legacy that he has created in the industry. Don't forget to tune in again soon.